viaLibri ~ Oorspronck ende voortganck der Nederlantsche kerckelijcke verschillen tot op 't Nationale Synodus van Dordrecht.Amsterdam, Cornelis de Leeuw, 1648. 2 parts in 1 volume. Small folio (28.5 x 19.5 cm). 18th-century half vellum. UYTENBOGAERT (WTENBOGAERT), Johannes and Bernard DWINGLO. Oorspronck ende voortganck der Nederlantsche kerckelijcke verschillen tot op 't Nationale Synodus van Dordrecht.Amsterdam, Cornelis de Leeuw, 1648. 2 parts in 1 volume. Small folio (28.5 x 19.5 cm). 18th-century half vellum. - Knuttel, Kerkgeschiedenis, p. 242; Rogge, Remonstr. geschr., p. 96; STCN (2 copies). Very rare re-issue, enlarged with an index and several documents, of a history of the Dutch religious controversies that arose during the Seven Years Truce. 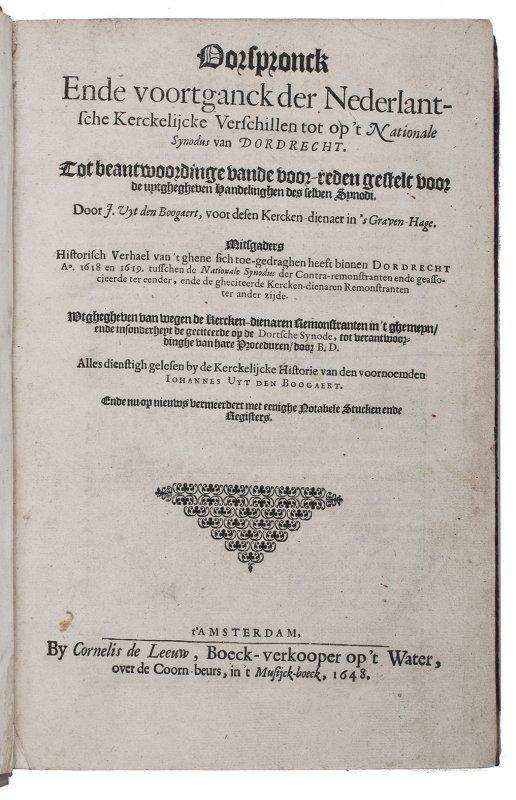 The work includes an almost verbatim report by Bernard Dwingelo of the acts of the Synod of Dordrecht (1618-1619), which ended with the official condemnation and banishment of one of the two parties, the Arminians or Remonstrants. The main issue had been the Calvinist article of faith regarding the issue of predestination, which was rejected by the Leiden theologian Jacob Arminius (1560-1609). Arminius's more liberal views were opposed by his strict Calvanist colleague Franciscus Gomarus (1563-1641).Title-page slight browned and thumbed, boards rubbed along the extremities. Overall in very good condition.